Map of the Mining Arc by Virginia Behm. New reports highlighting the environmental dangers posed by mineral exploitation at the Mining Arch of the Orinoco River National Development Strategic Zone have emerged, as Venezuelan officials try to convince Russia’s Alrosa (MCX:ALRS) to invest in the project. Best known as the “Mining Arch,” the project is a 111,843 Sq.Km concession area (12.2 per cent of the country’s landmass) for mining gold, diamond, iron, copper, bauxite, coltan, among other resources. Its main purpose is to bring cash into a country at the brink of default due to its $140 billion external debt, devalued currency and three-digits inflation rate. Nicolás Maduro’s government also says that the Arch would help curb long-standing illegal mining practices taking place in the southeastern Guayana region, comprised by the Amazonas, Delta Amacuro and Bolívar states. The gold-rich area, with reserves that the officials estimate in 7,000 tonnes of gold, is almost entirely controlled by gangs, who carry out bloody battles to mark off the boundaries of their mining territories. But environmentalists, university experts and Indigenous communities don’t think that the proposal to regularize activities in the area by opening it to multinational mining corporations would drive illegal miners away. They believe the opposite would happen and, on top of that, Venezuela’s section of the Amazon rainforest would be at risk. In their view, mining should be entirely banned there. 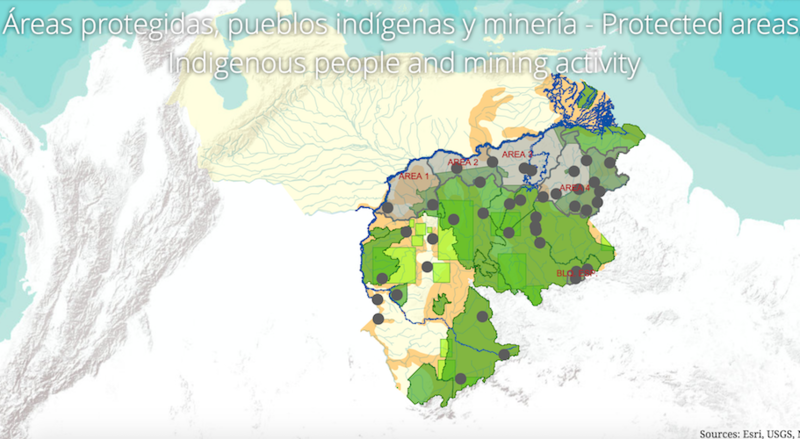 “The maps below are intended to alert the national and international community about some of the impacts that the Orinoco Mining Arc[h] project will have on the Venezuelan Guayana, which constitutes the upper reaches of the Guiana shield, part of the Amazon rainforest,” they state at the top of the minisite. The lack of proper environmental assessment about the potential impacts of establishing huge mining sites in the region is their main concern, as they note that the small towns surrounding the Arch are not only home to several Indigenous tribes, but also host the country’s most important river systems which are protected under a Special Administration Regime. On top of the already widespread use of mercury by artisanal miners, they worry that pollution would just get worse once big companies set up large tailings dams containing water contaminated with cyanide.